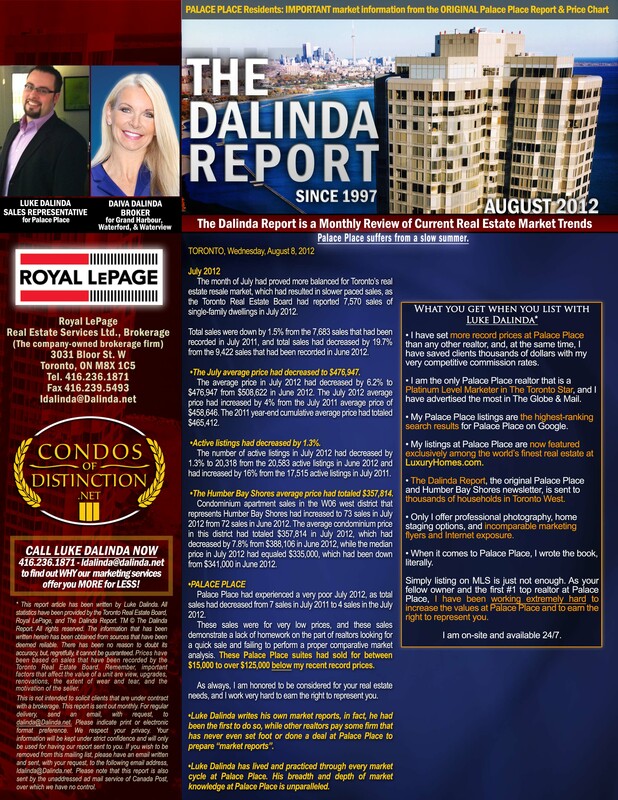 The Dalinda Palace Place Report, September 2015, is out! Suite 1205 had sold for the record price of $560,000, or $456 per square foot. Suite 1612 had sold for $355,000. Suite 906 had sold for the record price of $880,000. Suite 2306 is for sale at $869,000. Suite 2007 is for sale at $339,000. Palace Place had experienced a strong period from June 1, 2015 to September 4, 2015, as total sales had increased marginally from 9 sales in 2014 to 10 sales in 2015. This summer saw the return of bidding wars and great record prices at Palace Place. 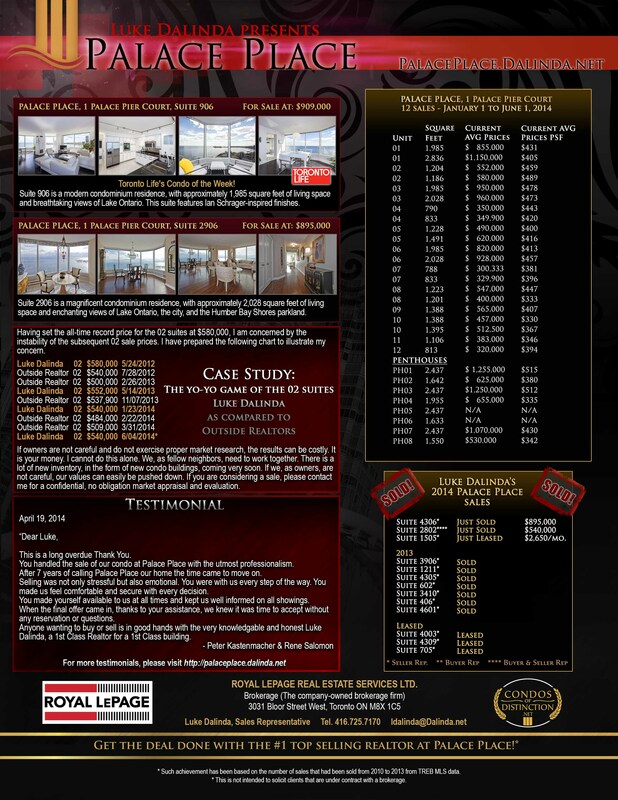 I had sold Suite 1205 for $560,000, or $456 per square foot, by having represented the seller. I had sold Suite 1612 for $355,000 by having represented the buyers and sellers. I had sold Suite 906 for $880,000 by having represented the seller. To find out how you can attract a bidding war for your suite too, please call me (416) 725-7170. From January 1, 2015 to September 4, 2015, the average price per square foot for Palace Place had been $425, which had been up from $405 in 2014, and a dramatic rise of 14.5% from $371 in 2012 (2012 had marked the beginning of major improvements at Palace Place). So far this year, there had been 322 sales of condominium units that had been sold for under $450,000 in the Humber Bay Shores area. During this time, there had only been 121 sales of condominium units that had been sold for above the $450,000 price point. Of that amount, there had only been 37 sales of condominium units that had been sold for between $500,000 and $600,000. Of those, only 4 sales were from Palace Place. Finally, since January 2015, there had only been 28 sales of condominium units that had been sold for above $700,000. Of those, only 5 sales were from Palace Place. To continue to elevate our price per square foot, we must be sure to do everything possible to make our suites presentable. Palace Place has been long known for its luxury standard, but we need to ensure that our suites live up to that standard too! 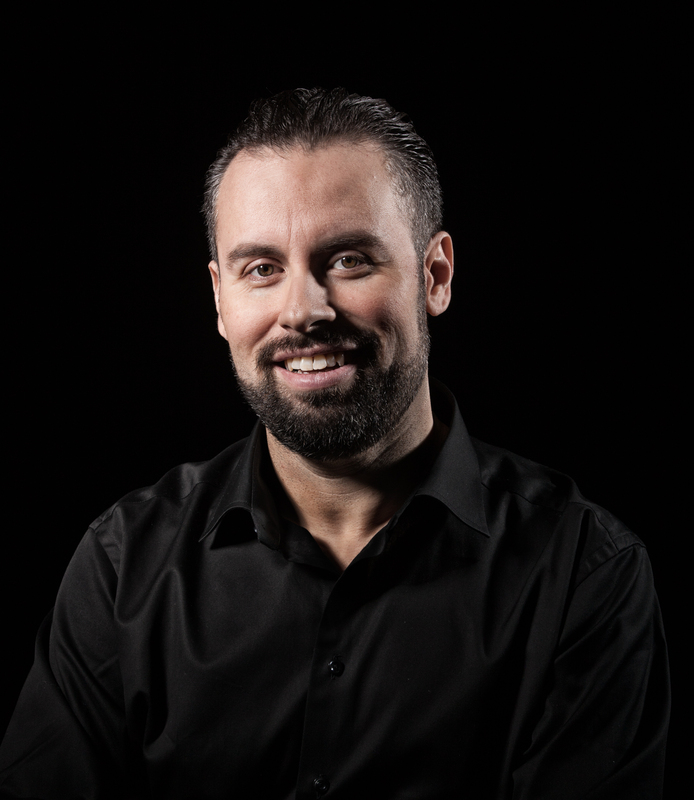 Luke is a dedicated professional agent whose Palace Place/Humber Shore knowledge and insights have surpassed all of our expectations. Furthermore, he is a joy to work with! Luke has helped us both lease and sell our beloved apartment. 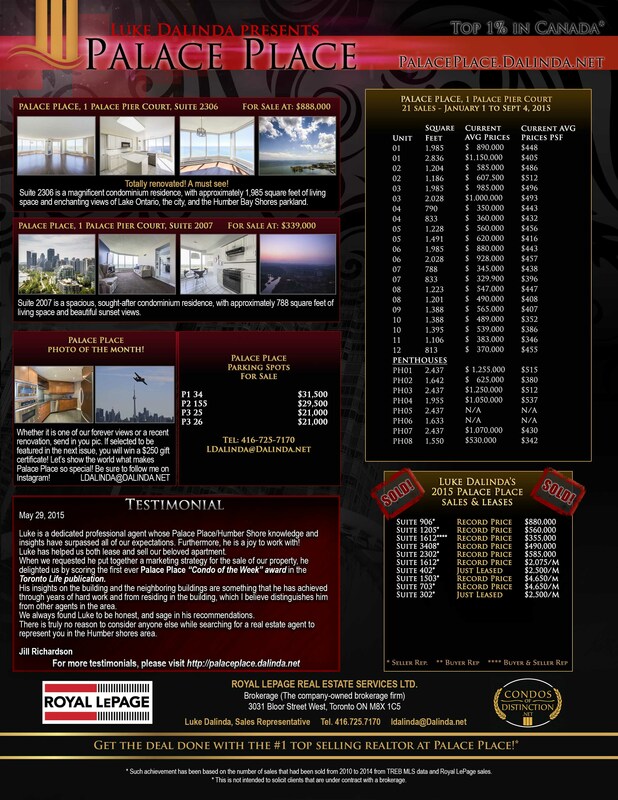 When we requested he put together a marketing strategy for the sale of our property, he delighted us by scoring the first ever Palace Place “Condo of the Week” award in the Toronto Life publication. His insights on the building and the neighboring buildings are something that he has achieved through years of hard work and from residing in the building, which I believe distinguishes him from other agents in the area. We always found Luke to be honest, and sage in his recommendations. There is truly no reason to consider anyone else while searching for a real estate agent to represent you in the Humber shores area. The Dalinda Palace Place Report, Summer 2014, is out! Palace Place had experienced a slow but solid period from January 1, 2014 to June 1, 2014, as total sales had increased from 10 sales in 2013 to 12 sales in 2014. Palace Place offers THE MOST for THE LEAST, just like Luke Dalinda! I had written and prepared this chart for the Palace Place 2011 AGM. The chart clearly shows the incredible deal that Palace Place owners are getting. 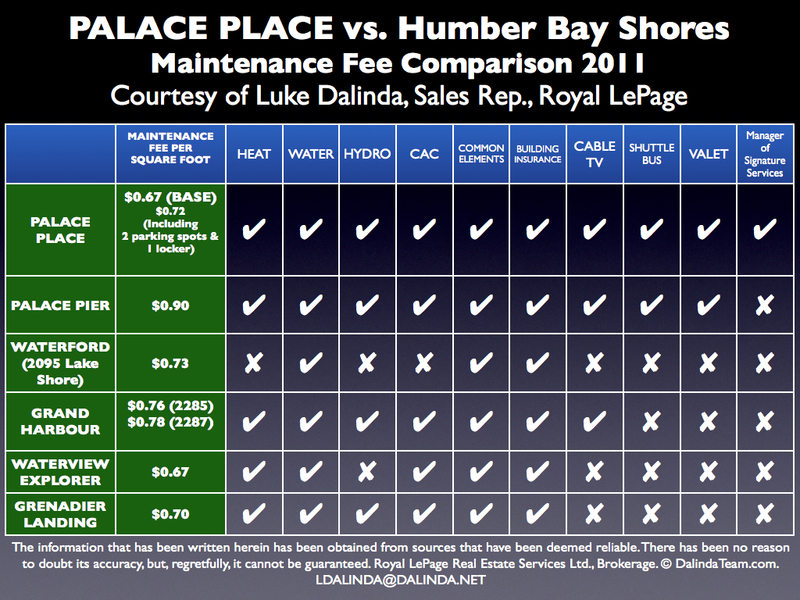 Palace Place pays the least maintenance fees for the most services in all of Humber Bay Shores. 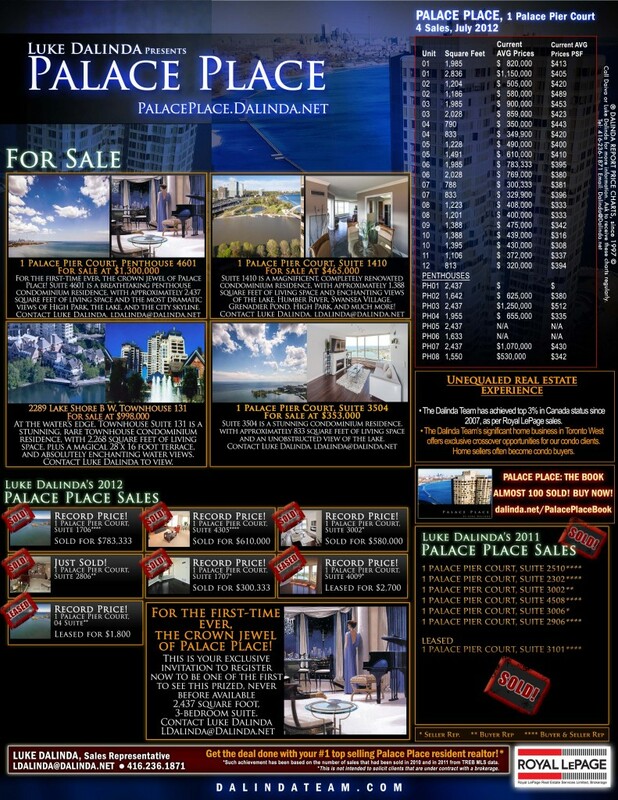 As I have been saying since 1997, Palace Place is the most prestigious, luxurious, and best managed waterfront condominium residence in Canada!